Earlier this July, the pharmaceutical company Pfizer announced price jumps for many of its brand name drugs, including the smoking cessation aid Chantix and the erectile dysfunction drug Viagra. But less than a month later, the company reversed course, seemingly bending to pressure from President Donald Trump, who called out the company on—what else—Twitter and then spoke to Pfizer CEO Ian Read directly. It was perhaps the best sign yet that the administration might do something meaningful about rising drug prices. It was probably just a blip in the radar, though. By November, Pfizer announced they would raise the price of 41 drugs under their umbrella in January, most of them by 5 percent. The drugs account for about 10 percent of the company’s portfolio, so for a company that generates around $53 billion in revenue a year, it’s a nice chunk of added change. This was always going to happen. In its rollback announcement this July, the company said it would only temporarily hold off increases, waiting until the end of the year or until Trump’s proposed blueprint plan for lowering drug prices, announced in May, began going into effect, whichever came first. But the case of Pfizer sums up the government’s current response to drug pricing. The U.S. continues to spend more and more on drugs, to the tune of $489 billion in 2017, according to an estimate by the Altarum Institute. While people’s out-of-pocket drug costs can be blunted by insurance coverage and patient discounts provided by drugmakers, those are projected to rise annually too. And even today, one of four Americans say they have trouble affording their medication. Trump has long pledged to tackle drug prices, even so far as to claim he would let Medicare negotiate directly with drugmakers during his 2016 presidential campaign. Trump predictably broke that promise, but he and his administration have still sworn to finally knock Big Pharma down a peg and pop the ballooning costs of life-saving medications like insulin. In reality, their proposed ideas and sometimes harsh words seem like nothing more than band aids to the gaping wound of high drug prices—and that’s just the way Big Pharma and Republicans like it. Trump’s 44-page-long drug pricing blueprint, called “American Patients First,” was touted as “the most sweeping action in history to lower the price of prescription drugs for the American people” by Trump himself (a man, it should be remembered, who is reported to avoid reading anything if he can). There are some commonsense tweaks in the blueprint that have been put into place already and that the government claims has lowered drug prices, like making it a little easier and quicker for the Food and Drug Administration to approve cheaper, generic drugs and biosimilars (biosimilars are copies of complex drugs sourced from living cells, like hormones). What is apparent that drug prices are continuing to shoot up, if at a slightly slower pace than before. While some companies joined Pfizer in pledging to freeze further price increases this year at least, most didn’t. In August, according to a Wells Fargo report, drug companies collectively raised the price of 60 drugs, while lowering the price of 32 drugs. 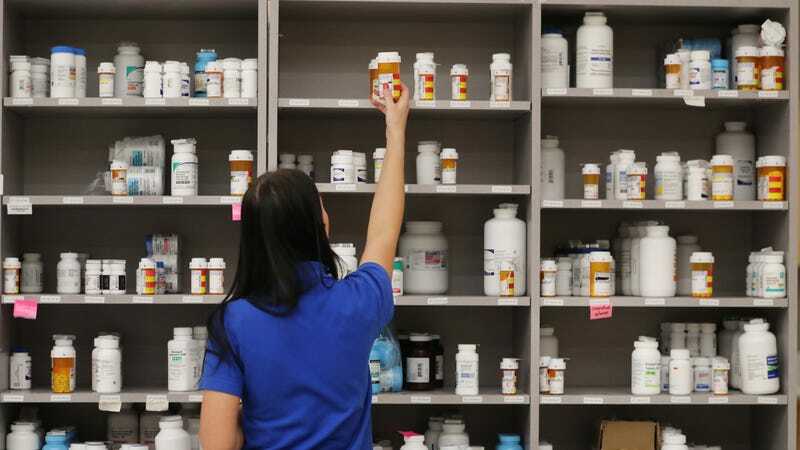 Another report by the Associated Press found that for every drug price drop reported up until September of this year, there were 96 price increases. “The drug price pledges made earlier this year were just for show—it was obvious at the time, and it’s obvious now,” Walid Gellad, director of the Center for Pharmaceutical Policy and Prescribing at the University of Pittsburgh, told Politico Tuesday. Reynolds does have hope that some of the White House’s proposed or upcoming policies could create a larger dent in drug prices. Next year, for instance, CMS will implement a policy that will grant certain Medicare plans (those managed by private companies) some negotiating power. Under the new policy, these providers can offer plans that force patients to first be given cheaper, alternative treatments for their medical problems, rather than brand name drugs (only if these treatments fail will patients then get the pricier option). The change only applies to Part B plans, which pay for drugs that are directly administered to you by a physician or a hospital, as opposed to drugs you pick up at a pharmacy. For context, about $25 billion was spent on drugs through Part B in 2015. Another solid idea floated by the Trump Administration, Reynolds says, involves making it so that select drugs covered under Part B are tied to an international price index. Under the plan, private vendors would obtain, distribute and bill Medicare for Part B drugs; Medicare would then only reimburse the costs of the drug at a comparable rate to what they cost elsewhere. Over the next five years, the CMS has estimated, the new model would result in a net savings of 30 percent from what would have been spent by Medicaid otherwise. “There have been some encouraging signs, particularly with Medicare Part B, which is a program where spending growth has averaged around 10 percent annually in recent years. So it’s an appropriate focus for policy makers,” Reynolds told Gizmodo. But while these steps might be nice, it seems foolhardy to believe that they’ll come anywhere close to reversing the overall trends in drug pricing or health care costs. Recouping some savings from a pot of $25 billion, if we’re using U.S. Part B drug spending in 2015 as a baseline, isn’t nothing, but Part B drug spending overall only accounts for three percent of total Medicare spending. And it’s even more naive to believe that Republicans are interested in seriously threatening the profits of Big Pharma by confronting them with the radical actions that could. For one, Republicans have fiercely opposed the idea of strong government regulations, including on the pharmaceutical industry. And sure, the industry might pay lip service to criticizing some of Trump’s drug pricing policies, particularly the Part B price index plan. But it’s perfectly content to spend money on electing Republicans to office. As Splinter noted last week, a report from Capital & Main this month found that the Pharmaceutical Research and Manufacturers of America (PHaRMA), the main lobbying and trade group of the industry, donated millions to various pro-Trump dark money groups and Republican super PACs in 2017. Meanwhile, on the left flank, Senator Bernie Sanders (I-Vermont) and Representative Ro Khanna (D-California) introduced their own proposal for lowering drug prices this week. It’s an amped up version of the Medicare Part B price index plan that would punish companies for continuing to sell any brand name drug at much higher prices in the U.S. than they do in similar countries like Canada and the UK. Those who do would be at risk of losing their patent protections early, meaning other companies could step in and produce their own generic versions. “Rather than improving the U.S. health care system and helping patients access medicines, these policies would threaten America’s ability to remain competitive and instead replicate flawed policies of countries where patient needs are brushed aside,” the lobbying group PHaRMA, the Pharmaceutical Research and Manufacturers of America, said of the Sanders plan in a statement to Gizmodo. The Sanders plan isn’t going to become law anytime soon, seeing as Democrats only control the House currently; in the Senate, Sanders’ version would likely not even be considered for a vote, much less pass. And there are legitimate questions about how much we can force drug prices down without unwanted consequences like lowering the amount of money spent on research by companies (of course, pharmaceutical companies are invested in pretending that tradeoff is much higher than it’d actually be). But Sanders and Khanna’s proposal is the sort of aggressive policy that actually matches the bluster Trump and others in the White House have occasionally spewed out. Anything less won’t really do anything to get ever-spiraling prices under control, let alone actually lower the cost of prescription drugs. Decolonizing Mars: Are We Thinking About Space Exploration All Wrong?